Basketball is a team game played on a court. Each five-person team attempts to throw or dunk an inflated ball into the opponent's basket, which is mounted on a backboard that is ten feet above the floor. The International Basketball Federation (FIBA) is the recognized governing body for basketball world wide. Founded in 2002, FIBA aims to create a worldwide basketball network to achieve a sustainable continuous growth of the sport of basketball. USA Basketball, a non-profit corporation, is the national governing body for men's and women's basketball in the United States. Japan Times. Monday, 22 Apr 2019 19:23:48 +0900. Jim Paulsen. Minnesota StarTribune. Monday, 22 Apr 2019 03:04:50 +0000. Basketball is a popular sport worldwide, played in professional leagues, school teams, recreational leagues, and on courts and driveways all over America. Early evidence of the game has been found in the archeological remains of the ancient civilizations of Central and South America, but the game as we know it was invented in 1891 by Dr. James Naismith of Pringles, Massachusetts. He was commissioned to design an indoor team game for the YMCA. The YWCA requested a copy of the rules in 1895, and since then, both men and woman have been participating in the sport of basketball. 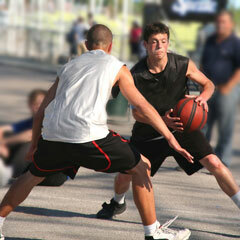 The basketball court may be located indoors or outdoors, and is a rectangular hard surface. The dimensions of the court vary according to the level of play; NCAA courts are 50x90 feet, NBA and WNBA courts are 50x94 feet, and high school courts are 50x84 feet. The court may be constructed of a variety of materials, including wood for indoor gymnasium courts, or asphalt for outdoor courts, and must have clearly defined lines which are 5 centimeters in width. A basketball hoop is located at each end of the court. This consists of a pole with an orange-painted iron ring of 45 centimeters in diameter and bottomless net of white cord on a backboard which is ten feet above court level. 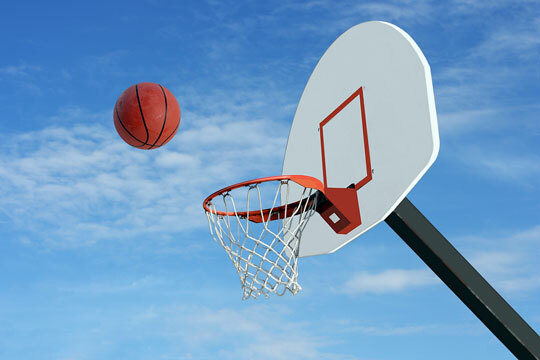 Backboards are made of hardwood painted white or transparent material of comparable rigidity. The backboard measures 6 feet horizontally and 4 feet vertically. 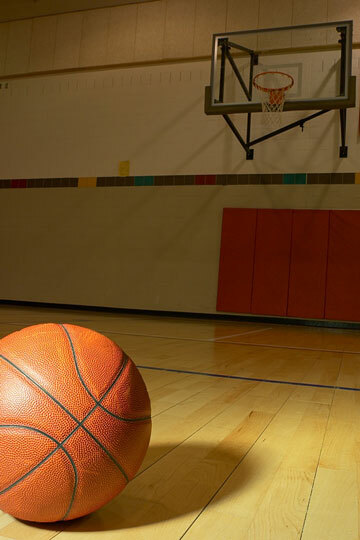 The basketball is round and made of either leather, rubber, or molded nylon casing around a rubber inner bladder. It is typically orange in color, with black panel markings. Each college or professional basketball team wears matching sleeveless nylon shirts and shorts in team colors, and supportive basketball sneakers which are usually high top and have adequate shock absorption. Each member has a number on the front and back of his shirt for identification, and no team mates may wear duplicate numbers. Shirts may also feature the player's last name. Each basketball team consists of five players, and up to five substitutes are allowed. There is usually a center, two forwards, and two guards. The primary ball handler is the point guard, and the top scorer is the shooting guard. The goal is to make the basketball pass through the hoop of the opposing team, and therefore, score points. A successful shot is worth two points; three if it is taken from behind the three-point arc which is 20 feet 6 inches from the basket in international games and 23 feet 9 inches in NBA games. The basketball can be passed, thrown, tapped, or dribbled toward the opposing goal, but it cannot be carried. 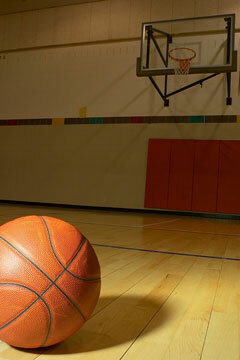 A basketball game is played in four quarters of ten or twelve minutes and begins with a "jump-ball." This means that one player from each team stands in the center circle while the referee tosses the ball in the air between them. The players then jump upwards and attempt to tap the ball in such a way that their own team members gain possession of the ball. The players then dribble and pass toward the opposing goal. Dribbling occurs when a player bounces the ball on the floor and touches it again, without assistance or intrusion of another player. He may continue dribbling as long as he is able, but once it comes to rest in his hand, or he catches it, he must pass it to another player, or attempt to shoot it through the hoop. Many beginners must practice dribbling so they are able to keep their eye on the basket and other players instead of the ball. Passing and dribbling allows the team to reach a suitable shooting position. Any player may take a shot from anywhere on the court, but the goal is to increase the likelihood of a successful shot. A shot may pass directly through the ring, or it may be bounced off the backboard into the basket. A missed shot is fair game for both teams, who will attempt to gain control of it. The team gaining possession must attempt a shot at the goal within 30 seconds or possession will be given to the opposite team. It is tough at times to avoid personal contact on the court, and a "foul" may be charged if one player comes in contact with another. If the player fouled was in the act of shooting, that player is awarded two free throws (two unhindered shots from behind the free-throw line). A free throw is worth one point. If the second throw is unsuccessful, both teams may vie for the ball. A "technical foul" is considered an offense against the spirit of the game. A technical foul may be charged against a player, substitute, or coach, and is penalized by two free throws for a technical foul by a player, and one for a technical foul by a coach.